Thinking about buying Terro Ant Baits? You're in the right place, because this article provides an in-depth review to help make sure you know what you're going to get! Ants are a common menace throughout the United States and a deceptively intelligent pest. It can be difficult to eliminate them because they form massive colonies and can hide from people. Terro Ant Bait is a highly recommended product from one of the oldest pest control manufacturers in the industry. It kills many different species of ants and comes in convenient, no-spill cups so people can use them around their homes. But is all of the hype about Terro true? This review aims to find out! Below is an in-depth product review which takes the pros and cons of Terro Ant Bait into consideration. Terro is a big name in the industry and manufactures a variety of products designed to capture and get rid of annoying ants. One of the most popular products is the liquid ant bait, which can be bought in packages with multiple stations. The ant bait can be used indoors and outdoors and features a versatile design which doesn't leak. This product is useful for people who don't want to handle pesticides or need to have a trap that can be placed in multiple locations like cabinets, the garage, or the back patio. Read Also: What's the best way to control fire ants? But can Terro Ant Bait really eliminate the entire colony? The main ingredient in the bait is boric acid, which is derived from borax. Borax is a pesticide approved by the EPA for general use and is a moderately toxic substance. It can kill entire colonies of ants within a week, but can take up to two weeks for maximum efficiency. "Terro Ant Bait is an extremely reliable and versatile product that genuinely seems to attract ants, although it takes some time to work"
Ants can be a nuisance whether they are in your home or outside. Pesticides and similar pest control methods can also be a problem, so you need to determine what risks and benefits you are comfortable with when choosing a product. Terro Ant Bait comes with many positives but also some negatives which you should consider when picking an ant control method. So, why would you want to use Terro Ant Bait over other products? The instructions for Terro Ant Bait are extremely simple. Remove baiting stations from package. Place around home or yard. Pick up and dispose of stations when done. Read Also: What's the best way to get rid of carpenter ants? The convenience of Terro is that there are no complicated procedures involved. See the below video for a demonstration of how the Terro ant bait works. Unlike some other ant baits and pesticides, the Terro bait can be placed inside or outside your property. The baiting stations won't be affected by the rain and are small enough to use in all of the corners of your home. The bait is also covered by a plastic sheath which is difficult for pets and children to get through. A lot of ant baits on the market require you to handle pesticides, whether it's the poisoned granules themselves or toxic liquids. 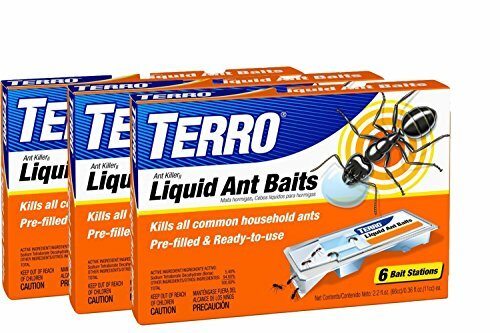 Terro features an ant bait which comes inside intact baiting stations. Ants can reach the attractive toxins, but it's difficult for you, your pets, and your family from touching them. You should still keep pets and children away from the product and wash your hands after use, but you don't have to work with the raw chemicals yourself. Ants who ingest the bait will die within a few hours to a few days, but not before bringing the bait back to the colony. It can take one week for the majority of the colony to perish, and two weeks for the entire group to die. People facing serious infestations can rest easy knowing that their problem will be partially alleviated almost immediately. Terro Ant Bait specializes in the elimination of sweet-eating ants but can work on most species which enter a household. Common black ants, pavement ants, cornfield ants, and pharaoh ants are all affected by the product, as are a half dozen others that can annoy you and your family. The Woodstream Corporation owns the Terro brand and offers a broad range of pest control products for the general consumer. Terro Liquid Ant Bait was first introduced in 1915 and is considered to be the "Gold Standard" when it comes to ant reduction and elimination. Despite some of its negative feedback across consumer reviews, many MANY clients praise the company's customer service. If you have a problem with the Terro Ant Bait, you can conveniently contact a representative to discuss the problem and either receive a new product or a refund. With how difficult it is to eliminate ants, it's helpful to receive aid from a business without further setbacks. The company additionally performs the majority of its own research for the projects to ensure their safety and efficiency for consumers like you. The active ingredient in Terro Ant Bait is boric acid, which is the derivative of the common borax. Boric acid is a highly effective pesticide which can eliminate many different types of pests, including ants, weeds, spiders, and mold. Boric acid disrupts the stomachs of ants and can then target the nervous system, causing failure throughout the body. The granules can also scratch the ant's interior. Humans should avoid all contact with boric acid granules because it can cause poisoning, seizures, and even death. However, the sealed baiting stations help lower the risks from coming into contact with the pesticide. Finally, boric acid occurs naturally in the environment and is relatively harmless in small doses. Too much can kill plants, and the product is slightly toxic to freshwater fish, but most birds, fish, frogs, and even bees are unaffected. 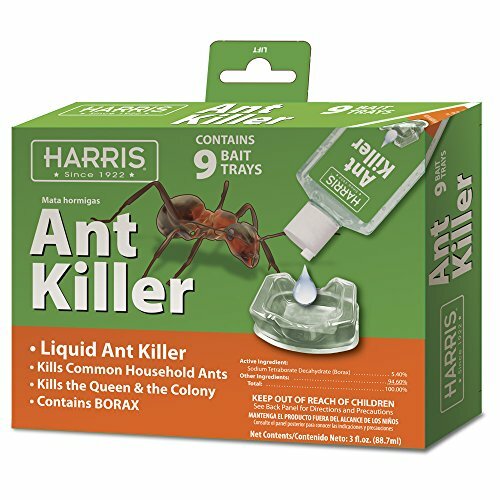 As mentioned earlier, Terro Ant Bait is extremely easy to use and only requires unwrapping the packaging and placing the stations throughout the affected area. This feature is useful for people who don't want to handle pesticides or who don't want a complicated process. The bait itself is not pet and child safe and should be kept away from curious hands and snouts. Terro uses baiting stations (the chemicals are inside a plastic container) which can help limit exposure and make it easier to use the pesticide throughout the house with minimal risks. Read Also: How long do ants live? Terro bait is effective against most ant types and works almost immediately to eliminate pesky pests. The product can take one to two weeks to wipe out a colony, but is versatile and comes with protective packaging. Both of these products are already near the top of the pest control market because of their flexible use. The two ant baits are EPA-registered for indoor and outdoor use and can be placed almost anyway. Terro and Harris additionally use similar ingredients because both borax or a borax-derivative to eliminate ants in an environmentally friendly manner. People with young children or curious pets could be putting their loved ones at risk, so I would not recommend it to those groups. Terro and Maxforce developed baits which are effective against numerous types of ants, including pesky pharaoh and odorous house ants. Both products can be used indoors and come with baiting stations for flexible placement. Unlike Terro, Maxforce does not have bait stations. Instead, you have a syringe of liquid that you'll need to apply the chemical to the affected area. This means that pets and children can easily access the toxin and could be poisoned. This product can be beneficial for people who live alone or have older children, but I would not recommend it to individuals with pets and children. Take a look below to see how you would deploy Maxforce Ant Bait. Both of these products can be used indoors or outdoors and feature powerful toxins that can eliminate an ant infestation fairly quickly. Similar to Max Force, Advion also comes in a syringe and has to be applied to specific areas. 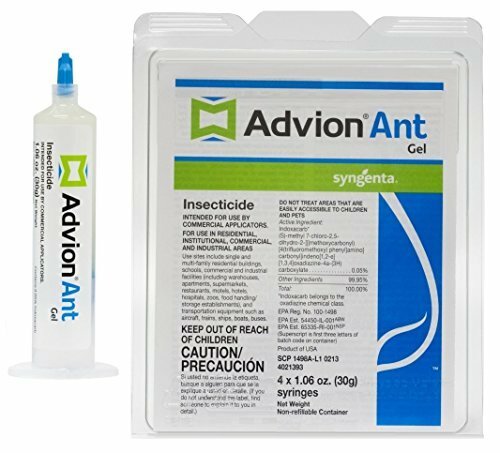 Advion is great and has been knocking down ant colonies for a long time, but we simply like the convenience of the Terro Ant Baiting system. If you go with an Advion or a Max Force, you're either going to have to be okay with putting the chemicals directly into the surface ares around your home or shell out a little bit more money to buy baiting stations. Also, liquid ant baits such as Advion and Max Force don't work as well when deployed outdoors, whereas Terro can be left just about anywhere. To give you an idea of how this type of bait works, take a look below at the timelapse video of ants eating Advion bait on a widow. People with serious ant infestations should consider investing in Terro Ant Bait because it comes with its own stations and is carefully sealed to prevent human contact with the toxins. The product works against numerous ant types, and the stations can be easily disposed of after use. Boric acid is also an environmentally friendly alternative to other pesticides and causes minimal damage. Finally, the company who produces Terro remains trustworthy and reliable while also dedicating a large amount of time to customer service. I highly recommend this product to people seeking an effective, relatively safe alternative to other liquid pesticides and ant baits. Terro Ant Bait has been getting rid of ant infestations since 1915 and is one of the best ways to kill ants in 2019. It’s easy to use, effective, safe, and extremely affordable. If you have an ant problem, we highly recommend investing in a couple packages of this stuff. Set my trap, checked it 10 minutes later and It was swarming with ants. I was amazed…really. So I’m wondering how it took me so long to find out about Terro which was on a neighbor web site. Now I have traps set in four places, all are active except one and thats the one behind the faucet for the kitchen sink, but I’m sure they will show interest because I see them in the sink. This really is a great product and so easy and safe to use with a great price. Thanks Senoret. Glad you’re seeing results Jane! Make sure to remove all other potential food sources (e.g., crumbs, drinks, etc) in the area for the trap to be as effective as possible. I wish. I’ve had mine out for about 1/2 hour. I have six traps set right along the ant’s path to my desk and they are avoiding the traps like the plague. Giving it time, for sure, but I hope it was worth the time in the end. The new “twist off” Terro liquid ant bait traps don’t work. The ants won’t do the gymnastics to use them. I used the OLD traps, and they were literally swimming with ants while the new ones were completely empty. We have noticed those new products on the market as well. It seems Terro is experimenting with a new setup. We’ll look into updating our guide to reflect the new packaging. It’s great that ants swarm, but how effective is it at actually causing the problem to go away? Vicki it sounds like you have too many traps lined up along the trail. wipe down their trail so its not as strong for them to follow then place the bait stations back They will go into them I p promise. Are Terro Ant Granules safe to put in a vegetable garden….lightly sprinkled around tomato, beets, carrot plants? I would not put the granules inside the garden, rather line them up like a barrier outside the garden to prevent ants/pests from getting in. I placed these ant baits on my kitchen counter to get rid of the few ants I had. Within a couple hours, I had every ant in the neighborhood crawling into my house, like in the videos. Exactly when do the traps stop attracting ants? I cleaned my kitchen with soap and bleach. The ants haven’t returned in a few days. Basically how it works with ants is that the workers will find a food source then leave behind a pheromone trail to help other ants find the food. Since you left out some ridiculously tasty food for ants, you had a LOT of trails leading to your house. Give it a week or so and things should naturally resolve themselves. Terro got rid of my ant problem. Terro is the best in the biz when it comes to ant removal. Glad it sorted out your problem. I have swarms of ants in my kitchen. I Have always used TERRO so I purchased 6 packages. First I noticed new packaging and new trap openings. I opened 4 and set them on my counter. In the past, I could put 1 down and they would be swarming with ants within 5 minutes. These have been on my counter 4 days and only 1 package had any ants at all. The new package openings have to be twisted off and the opening sits up too high off the counter. The ants have to climb to the top of the bait trap to enter. The new packages do not work, not sure if it is the formula or the opening. I hate it but I must try another product and hope I can get control of the ants in my kitchen. I cant even use my stove to cook. Hmm, I doubt they’d change formula and by the looks of it, I don’t see any changes. My guess is that you might be dealing with a different type of ant. Terro bait specifically targets ants that prefer a sugar meal (aka sugar ants) as opposed to protein ants (like fire ants or carpenter ants). Maybe give a different bait a go closer to your counter to see if it works. I like Advion Gel personally. I found that if I poured a little out in a puddle so they could find it, it works better. I turned over a plastic container on top that had handle holes, the ant had no trouble getting under it. I wouldn’t do this with kids or dogs in the house. Or young curious cats. My elderly cats don’t even notice it in the corner. What worked really well was the Terro that came in the cup on top of the green container. Sorry to see it doesn’t seem to be sold anymore. I would have to dip a little out onto the surrounding area (only up on the counter away from pets) so that ants could find it. I had to do this every day or so because once it’s dry they are not attracted. But it worked really well. I bought in bulk, but now two years later it has thickened up and doesn’t seem to attract them as well. Wish you would go back to these protected dispensers that worked really well. Just don’t expect the ants to go up into them, you have to dip a piece of stiff paper in and scoop some out to make little puddles around it, then they are right into it. Every ant gone in a few days. i agree with dorothy! i too, have used terro for years and love it. i would even buy it for all my tenants. unfortunately the new packaging DOES NOT WORK. with the old style traps you would snip off a small opening on the bottom of the trap, set it along the ant trail as near to their entry point as possible, and the ants would swarm around, crawl inside, and within days, the ants would be gone. when i put the baits near the entry points, the ant trail would cease because they would go no further than the terro bait they loved it so much. now, using the new twist off opening baits, because the opening sits above the surface the ants cannot crawl inside to get the bait. the ant trails just keep coming totally ignoring the terro bait traps. i have tried these new traps in several apartments with the same disappointing results. i know its the trap style because i have a couple of old traps that i put down and as always, they are working like a charm. i, too, am looking for another brand of bait traps. TERRO, PLEASE BRING BACK THE ORIGINAL TRAP STYLE! Had to cut the top off the trap as it definitely would not twist off. As it is placed on the bathtub rim, I thought I could remove it while I shower and then put it back, but this looks like a pretty awful process since it is swarming with ants. How do you recommend I deal with an active trap in the shower/bath?